It’s one thing saying children learn through play, but it’s another thing trusting it. We’re compelled to look for the evidence. The evidence is right there. All we need to do is look. 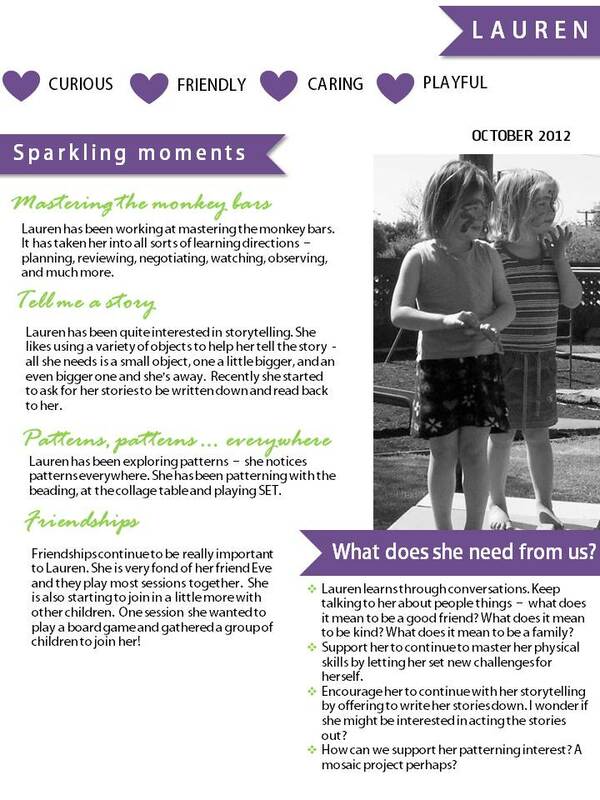 Writing stories about children’s learning is a powerful way to to build an image of that child’s learner identity. To honour the complexity of children learning, these prompts can help to look beyond knowledge and skills to notice the wonderful intricacies of our children’s learning. One purpose of documenting children’s learning is to be able to capture the progress in children learning. The word progress can be defined as ‘the forward or onward movement toward a destination’. So with that definition in mind we have to think about what is the destination we are moving towards? Mana atua = I have power over myself. I know my own strengths. I value my whakapapa. Mana reo = I share my views. I ask for what I need. I express my ideas. Mana auturoa = I explore the bigger world. Mana tangata I take care of others. I take leadership. Mana whenua = This place is my turangawaewae. I join in. Margaret Carr developed a notion of progress here as the ABCD framework – where the measure of progress involves four key elements – agency, breadth, continuity and distribution. Learning stories provide us a powerful tool to capture this learning. A learning story generally captures a moment in time to illustrate the child’s learning. A learning story can also capture a child’s learning over a longer period of time – this will provide a holistic picture of the child as a learner. Below are three examples of what that might look like. In Playcentre the end of session korero is pounamu. It’s a time to stop and reflect, to connect, to share stories and to learn from each other. When thinking about documenting it, it’s a good idea to think about the purpose of the documentation. Why are you documenting this? What do you do with the information you documented? 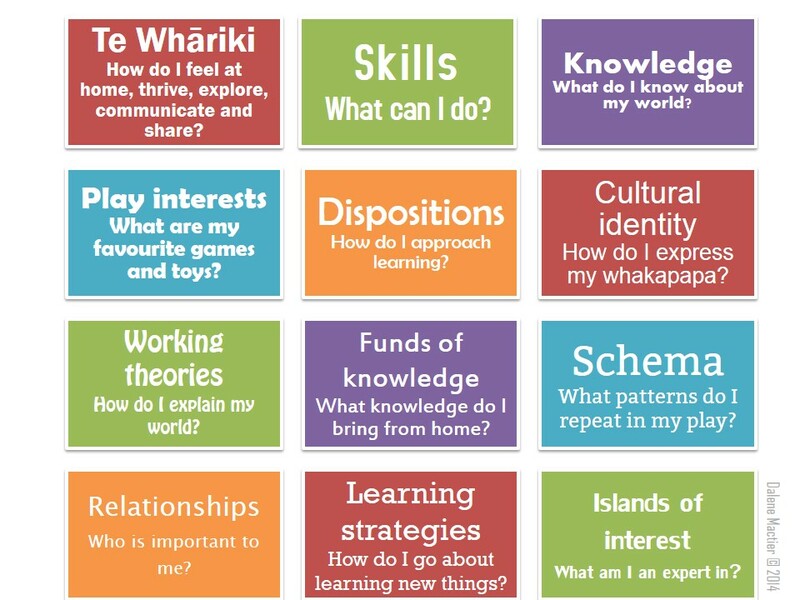 How are you going to use this information to do things differently for your tamariki? When we document children’s learning we want it to be more like storytelling and less like paperwork. We want it to be about the children rather than complying with requirements. There is no right or wrong way of documenting the end of session korero. Try different things. Keep what you like and tweak what is not working. 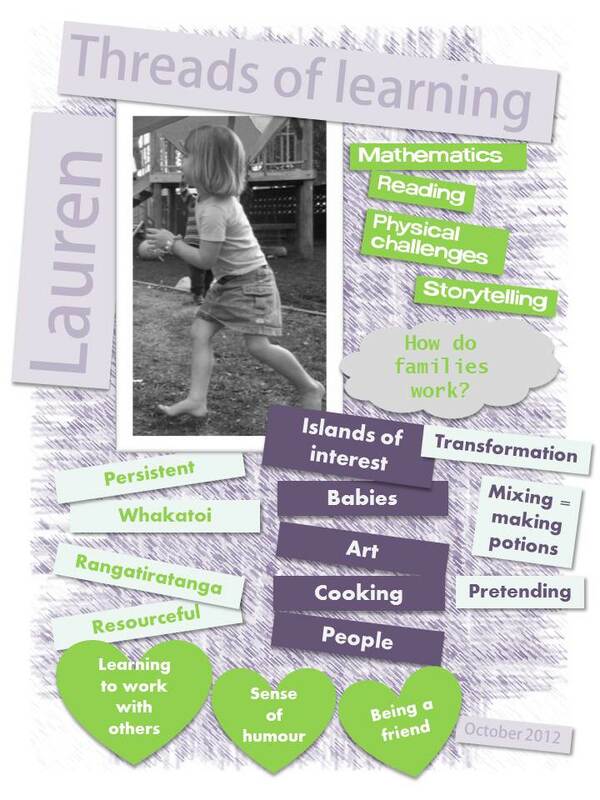 A key outcome of documenting the end of session korero is to capture the emergent play and learning interests. This end of session is designed to focus on capturing emergent interests. 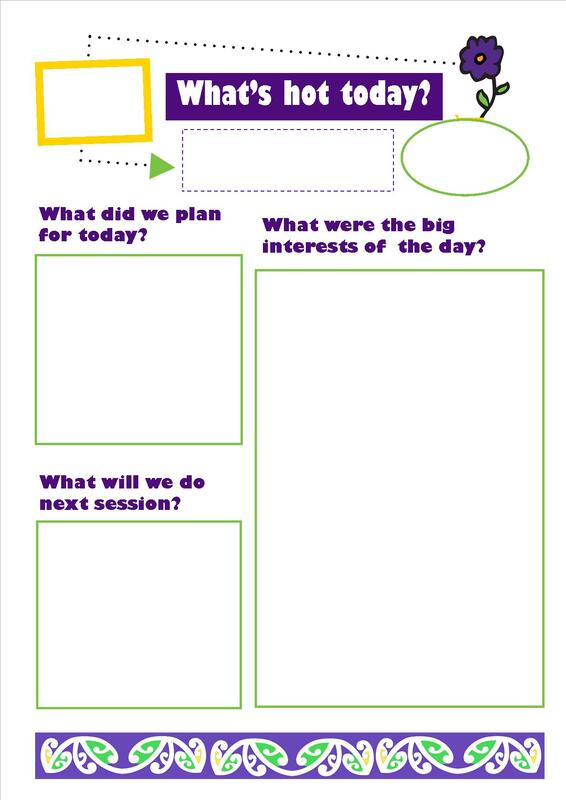 Good questions will help you to generate powerful conversations at the end of session. Capturing the emergent interests on session helps us to make decisions about the next session. 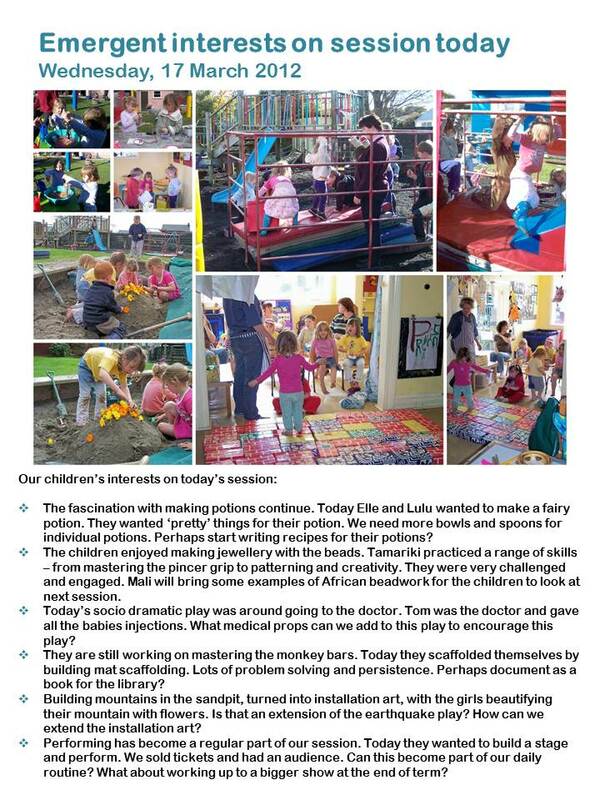 See below examples of how centres document the emergent interests of the children’s play and learning. 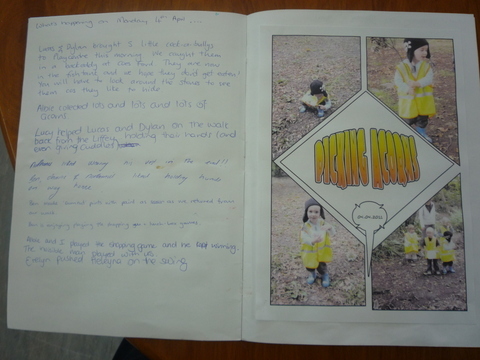 Lincoln Playcentre keeps a session profile book for each of their sessions. 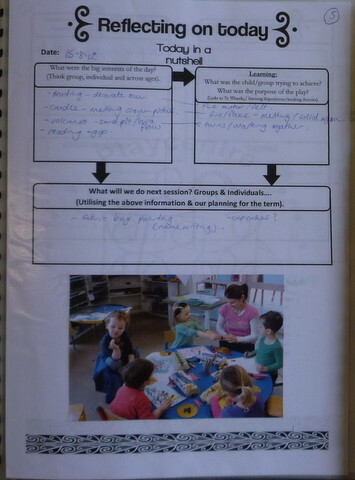 North Beach Playcentre captures the day’s learning as a mindmap. 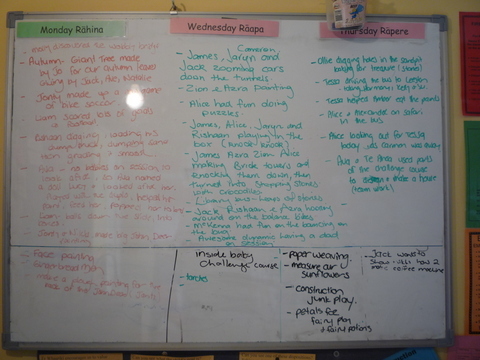 Southbridge Playcentre notes the day’s play and learning on a white board. 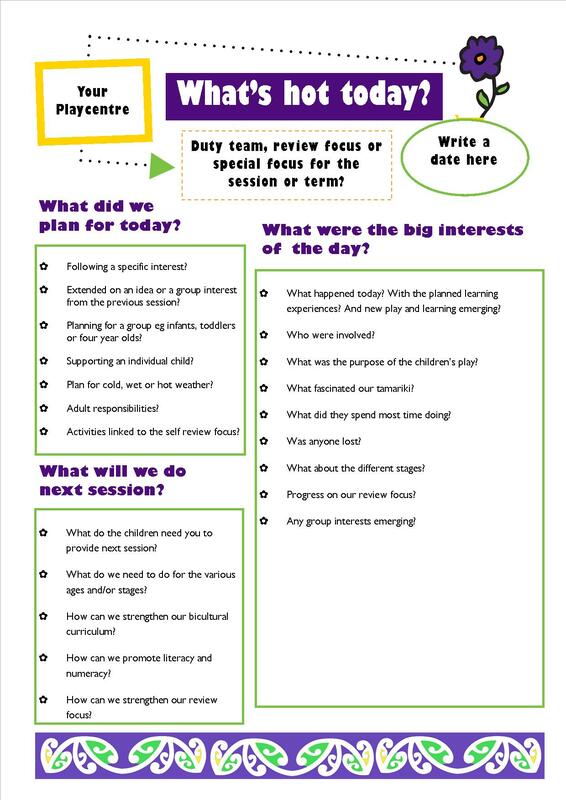 River Downs Playcentre revamped their end of session evaluation form to capture the important emergent interests for the day. I would love to see other creative ways of capturing the stories of the day. Playcentres are frequently asked how they link their work in Playcentre to Te Whāriki. 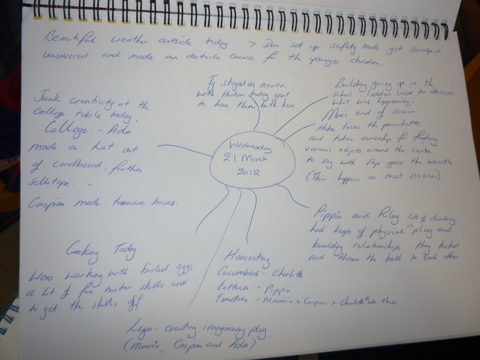 Are we expected to make overt links by writing a strand and a goal on each learning story or can we achieve this in different ways? Whakamana: Children learn best when they are empowered through their experiences. At Playcentre children actively construct their own learning through play. Playcentre sessions are designed to help tamariki to see themselves as competent and capable learners in that children can choose what they do, how they do it and for how long they choose to do it. Constraints are kept to a minimum. Kotahitanga: Children learn best when we acknowledge the complexity of children’s learning. A Playcentre we place a high value on play opportunities that allow exploration and experimentation. Honouring the process of the child’s work is more important than the product itself. Learning at Playcentre is integrated into every Playcentre experiences. Adults strive to understand children’s passions and fascination and build on it by providing interesting and inviting play opportunities. Whānau tangata: Children learn best when their learning is embedded in the context of the community. Being a whānau based organisation, whānau at Playcentre not only manage the centre, but are also the teachers of their tamariki. Most Playcentre whānau attend the Playcentre down the road and as such they bring the community into their centre. Children learn about the community and develop a sense of belonging from the parents working together. Ngā hononga: Children learn best in a relationship with someone else. Relationships are a key part of successful Playcentre sessions. Good relationships are valued and actively fostered through the cooperative practices. Children experience an environment where they can play alongside their siblings, parents, whānau and other familiar adults. Relationships are often extended beyond Playcentre sessions. People, and the quality of their relationships, are an integral part of a young child’s developing attitudes and beliefs. The intention of Te Whariki is to uncover possibilities, rather than cover specific developmental milestones or knowledge . It does not tell us what tamariki should be learning, but how they learn best. Instead of linking the strands to play and learning outcomes, we can turn it upside down and use the strands to evaluate whether we are creating potentiating learning environments for our tamariki either as individuals or as a group. Mana Whenua: How do we provide an interesting environment where our tamariki feels at home? Mana Atua: How do we provide a trustworthy environment where our tamariki can thrive? Mana Aoturoa: How do we provide the right level of challenge so that our tamariki are stretched? Mana Reo: How do we provide a culture of listening so that our tamariki can share their thinking? Mana Tangata: How do provide a collaborative environment where our tamariki can learn to work together? Returning to the question of whether we need to link our documentation to Te Whāriki? When our programme is embedded in Te Whariki, it seem superfluous to overtly link stories and other document to Te Whāriki for the purpose of accountability. We can expect outside agencies to be informed readers, however at times overt linking can be a good teaching tool for families who are new to Playcentre and Te Whāriki. How do you make Te Whāriki visible in your centre? Ministry of Education. (1996). Te Whāriki: He Whāriki Mātauranga mō ngā Mokopuna o Aotearoa: Early Childhood Education. Wellington: Learning Media. Stover, Sue (Ed). (2003). (Revised edition). Good clean fun: New Zealand’s playcentre movement. Auckland: New Zealand Playcentre Federation. Page 38.